Summer is here (with a vengeance if you’re anywhere near Atlanta, GA these days! ), and while it’s not football tailgating time, the menus are pretty much the same: casual, delicious and transportable. 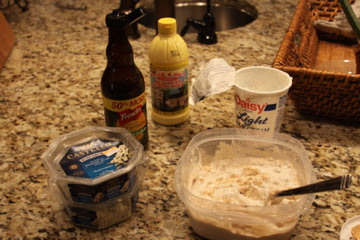 Place the sour cream, blue cheese, lemon juice, salt, and Worcestershire in a medium nonreactive bowl and stir until well combined. Fold in the avocado, scallions, and parsley, transfer the dip to a shallow serving dish, and top with the bacon. 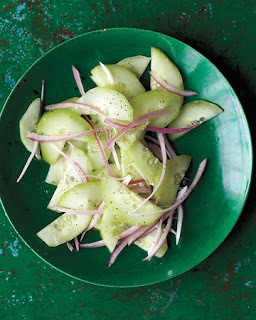 Serve with celery sticks or assorted crackers. Preheat oven to 225°F. 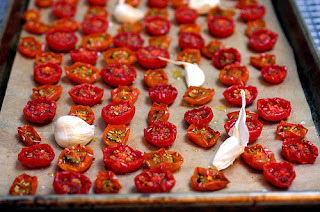 Halve each cherry or grape tomato crosswise, or Roma tomato lengthwise and arrange on a parchment-lined baking sheet along with the cloves of garlic. 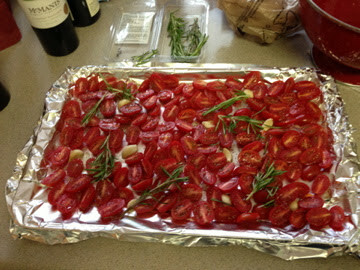 Drizzle with olive oil, just enough to make the tomatoes glisten. Sprinkle herbs on, if you are using them, and salt and pepper, though go easily on these because the finished product will be so flavorful you’ll need very little to help it along. Bake the tomatoes in the oven for about three hours. 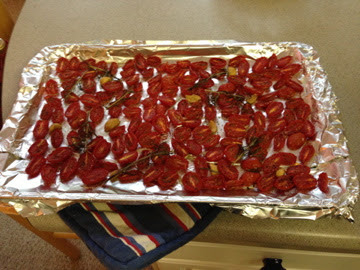 You want the tomatoes to be shriveled and dry, but with a little juice left inside–this could take more or less time depending on the size of your tomatoes. Serve immediately warm or later at room temperature. In a bowl, combine sugar, water, vinegar and salt. Refrigerate overnight. 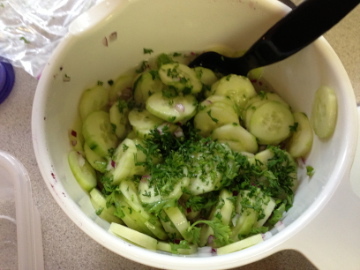 1 to 2 hours before serving, add cucumber, parsley flakes and onion to the dressing and mix well. 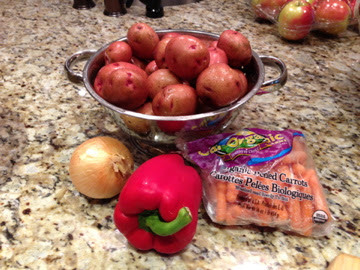 Place potatoes and onion in a steamer basket. 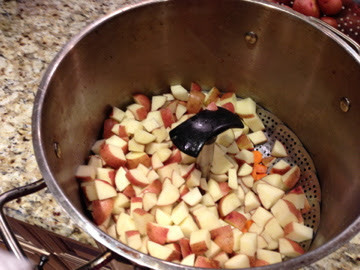 Pour enough water into the pot to make a depth of 1/2 inch. Steam vegetables, covered, for 8 minutes, or until the potatoes are just tender. 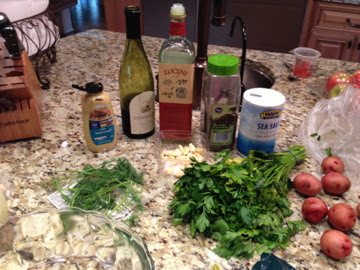 While the potatoes are cooking, whisk together the Day 1 Dressing ingredients. 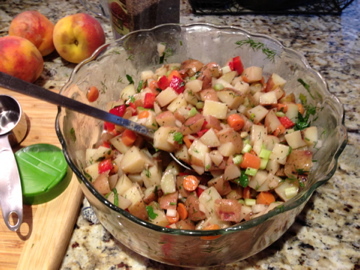 Transfer hot potatoes and onion to a large bowl and mix with the Day 1 Dressing, bell pepper, celery and carrot. Let stand 5 minutes before serving. 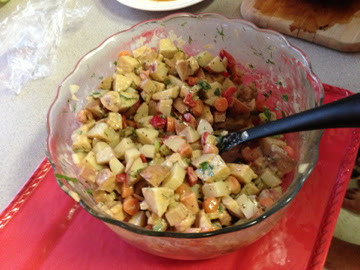 The next day, whisk together the Day 2 Dressing and mix with the leftover potato salad. Adjust seasoning with salt and pepper. 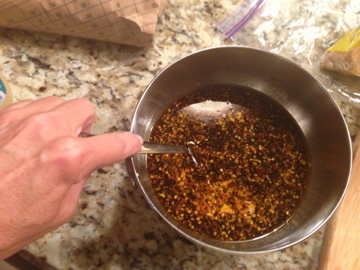 Whisk together soy sauce, sugar, vinegar, worchestershire, dijon, red pepper flakes and pepper. Place steak in glass 9×13 dish and pour sauce over. 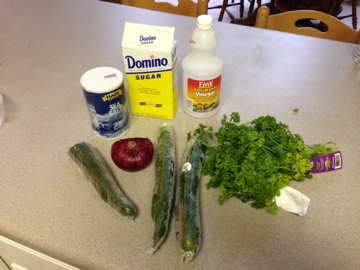 Cover with saran wrap and refrigerate overnight. Heat grill to high. 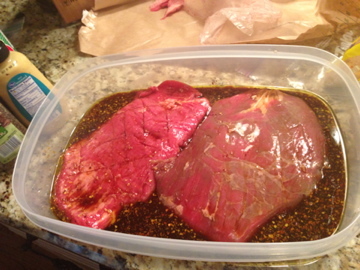 Remove steak from marinade. 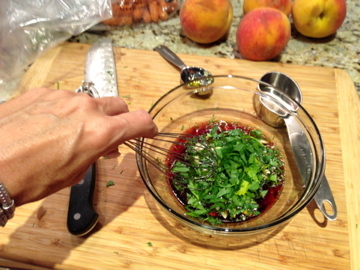 Pour marinade into a saucepan and simmer until reduced by half – around 10 minutes. Clean and lightly oil hot grates. 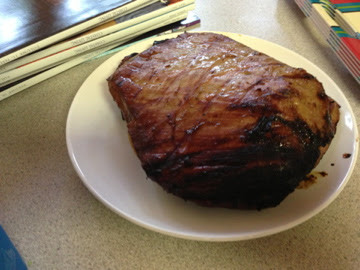 Grill steak, covered 6 minutes, then turn and brush with the glaze. 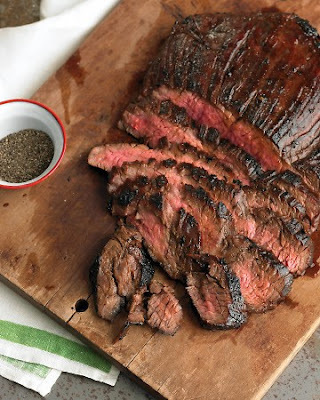 Grill until medium rare about 6 minutes longer. Rest 10 minutes before slicing. 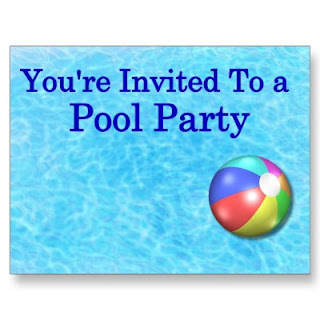 Preheat oven to 350 F. Spray an 8×11-inch baking dish with nonstick cooking spray or rub generously with oil. 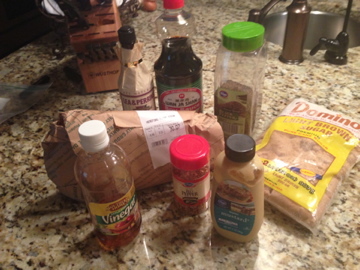 To make Crumb Mixture, mix together flour, baking soda, salt and cinnamon. Stir in oatmeal, brown sugar and nuts, and mix well. Add oils and stir until mixture is crumbly. 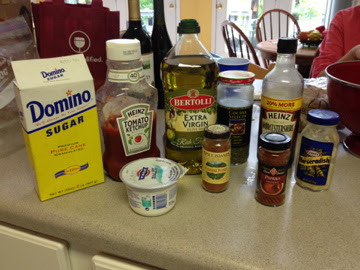 Set aside 1 cup of mixture. Press remainder into bottom of baking dish. Bake for 10 minutes. Meanwhile, combine blueberries and sugar in a saucepan and cook at medium heat for 2 minutes. 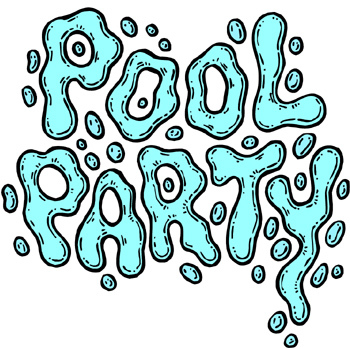 Dissolve cornstarch into cold water and orange juice. Add cornstarch mixture and zest to blueberries. Stirring constantly, cook until thickened, about 45 seconds. Pour blueberry mixture over partially baked crumb crust. 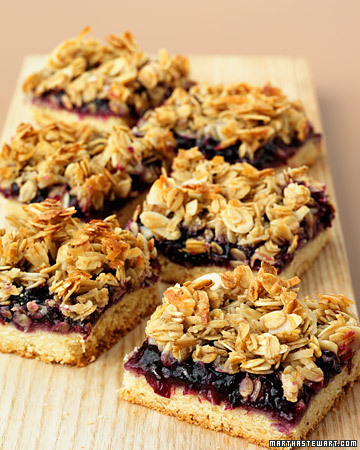 Sprinkle reserved crumb mixture over top and gently press into blueberry filling. Bake until top is golden brown, about 18 to 20 minutes. Cool on a rack before slicing. Combine plums, apple, orange, raspberries and vodka in a nonreactive bowl. Let stand, uncovered, at room temperature for 2 hours. 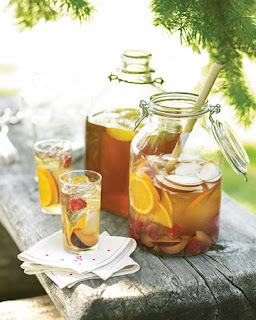 Combine wine and sugar in a pitcher, and stir until sugar dissolves. Add fruit mixture, and stir gently to combine. Serve over ice. All dishes are cool and refreshing and can be prepared ahead of your guests’ arrival.